Sol Lesser - independent filmmaker who at various times in his career served as indy producer, distributor, and exhibitor. One of the three new additions to SIMPP in 1942 was industry pioneer Sol Lesser whose experience in all three branches of the film industry made him a unique SIMPP member. At the age of 17, Lesser inherited his family's San Francisco nickelodeon upon the death of his father in 1907. Following an aggressive expansion into distribution, he became a leading film exchange operator in California. He also ventured into production, and became a vertically-integrated mainstay at First National. In 1920, Lesser founded the West Coast Theatres, in partnership with Abe and Mike Gore, which also rapidly expanded until it became the main first-run theater chain in the Pacific states. With plans of a leisurely retirement, Lesser sold his West Coast interests to a financier in 1926. Shortly thereafter the independent chain fell under the control of William Fox, and the Fox West Coast Theatres became the scourge of the independent producers for many years. His retirement was short; and boredom prompted his reentry to the film industry as an independent producer with his own company called Principle Pictures. His purchase of a small Los Angeles theater became the start of his Principle Theatres chain. He even formed the Principle Distributing Corporation, and later created his own financing operation, the Principle Securities Corporation. His friendship with other veteran independents also created strong ties at both United Artists and SIMPP. When Joseph Schenck was at UA, Sol Lesser was closely associated with him in several film and theater ventures. The Lessers were instrumental in bringing Walt Disney to United Artists in the early 1930s, and remained life-long friends of the Disneys. 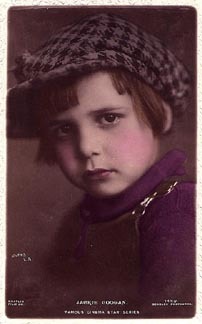 First National child star Jackie Coogan. Lesser's association with Charlie Chaplin went back even further. Back at First National, Lesser claimed that part of his responsibility was to deliver Chaplin his payment upon delivery of his films. In the early 1920s, Lesser began producing pictures with child star Jackie Coogan concurrent with Chaplin's masterpiece The Kid (1921). Lesser respected Chaplin's desire to postpone the release of the Lesser-Coogan films until after Chaplin completed his film. By doing so, Lesser not only ensured a friendship with Chaplin that lasted for years, but Lesser also found that his films with Coogan were far more valuable by waiting until after the success of The Kid. Chaplin even invested in the Progressive Theatres at a time when Chaplin refused to become a partner in even the United Artists Theatre Circuit. Chaplin held on to the Progressive stock for many years, and during his exile in the 1950s, Lesser visited Chaplin in Switzerland and repurchased the shares of the theater company. Sol Lesser also produced the Tarzan movies beginning in the 1930s, another excellent example of the urbane business methods of the respected producer. In 1931 when MGM was making the highly-anticipated Tarzan the Apeman (1932), Lesser announced that he had previously acquired the film rights to the Tarzan character from another independent producer who had optioned the rights from Edgar Rice Burroughs himself in 1928. The courts upheld Lesser's rights, and Lesser was in a position to put the screws to MGM. Surprisingly, Lesser allowed MGM to continue with its version for a nominal fee. This resulted in a tremendous coup for Lesser. By momentarily stepping aside, just as he had with the Chaplin-Coogan arrangement, Tarzan the Apeman became a sensation for MGM in 1932, and left Lesser with the lucrative film rights to future film adaptations. By not alienating the creator of Tarzan, Lesser also entered into a close association with Edgar Rice Burroughs. 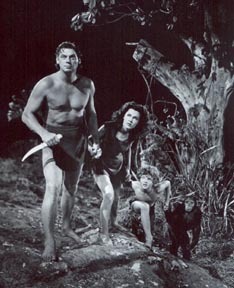 Lesser released his own Tarzan films through his Principle Distributing Corporation in 1933, and the series became one of the mainstays of his independent operation. In the fall of 1941, Sol Lesser took an executive producer position at RKO but found it lacking the excitement of independent production. During a management shakeup at RKO shortly after SIMPP was formed, Lesser decided to return to independent filmmaking during this exciting time for the independents. He quit RKO in February 1942, after only six months as an executive, and joined the Society of Independent Motion Picture Producers. Sol Lesser: Biography of Sol Lesser, AMPAS; "Sol Lesser, 90, Predated Nearly All Industry Pioneers; 117 Features," Variety, September 24, 1980, p. 4; "Producer Sol Lesser, 90, Movie Industry Pioneer, Dies," LAT, September 20, 1980, sec. II, p. 1; "Sol Lesser Busy in Chicago," New York Morning Telegraph, January 16, 1921; "Sol Lesser, Benedict Quit RKO," DV, February 2, 1942, pp. 1, 6; Hildy Crawford, "Sol Lesser: History of Films," Palm Springs Life, January 1965, p. 20; Essoe, Tarzan of the Movies, pp. 72-82; Lasky, RKO, pp. 166-167.